I don’t review enough puzzle games. It’s a shame, since there are a lot of great puzzle games out there, from the classic Tetris to Puyo Pop. I guess it’s just hard to reinvent the puzzle wheel without coming up with some really good gimmicks that will actually lead to addicting gameplay and not be frustrating. As usual, Nintendo has found a way to just that. Dr. Mario is one of those games. I never thought I would like this kind of puzzle game where you had to match four of the same color to eliminate viruses, but it has become one of my top five puzzle games. And since Mario got a slice of the pie of being in the medical field, why not Luigi? Well, now he can! 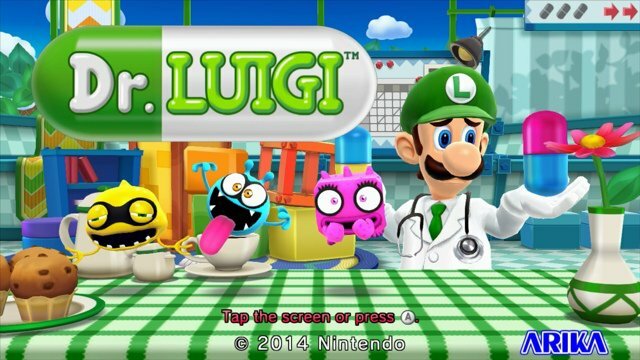 Enter Dr. Luigi, exclusively for the Wii U. I really didn’t expect this game to come out, but since it’s the Year of Luigi, I guess I shouldn’t have been surprised. How is it? Is the $15 price tag worth it? Read on to find out! Since the story is basically Luigi needing to stop some viruses from space, I am going to move onto gameplay. Dr. Luigi is a puzzle game. I know, it’s a big shock. 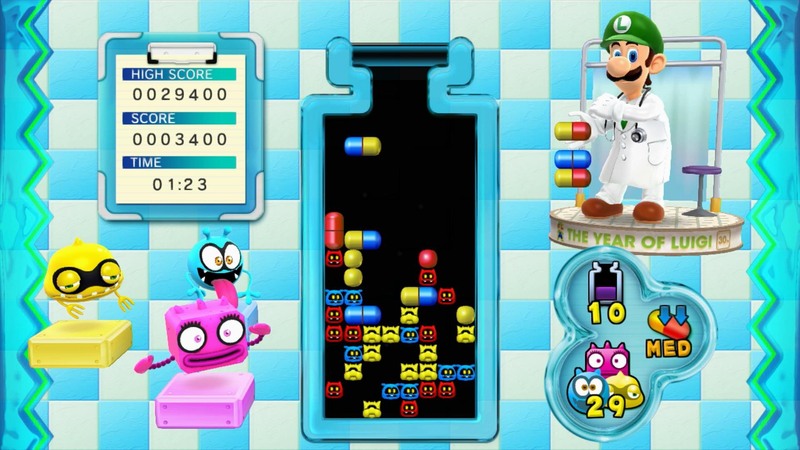 If you have played the original Dr. Mario, then you will be very familiar with this game’s main mechanic, the pills. Your main goal is to line up a certain colored pill onto one of the viruses of the same color. Once you get four or more of the same color on said virus, it gets eliminated. There are four modes you can play through. The first mode throws a new mechanic in the form of L-shaped pills. Instead of the normal two-colored pills, you get L-shaped pills. Sure, it might be easier to eliminate viruses this way, but after a few levels, just putting the dominant color of the pill on the virus isn’t necessarily the best thing to do when you have that one spare color falling onto a virus that isn’t necessarily the same color. The next mode allows you to play the original Dr. Mario. Well, at least play with the original gameplay intact. The third mode is Virus Buster where you play with normal two-colored pills that you can control with the stylus as they slowly move down the screen. You will have to deal with more than one pill once the levels go up, so watch out. The last mode is online play. You can play online with friends against the new operation L mode or the classic Dr. Mario mode. Each mode has you playing by yourself, against a computer player, against someone else, or playing against the computer to eliminate all of the viruses. There really isn’t much else to this game besides those four modes. The graphics are pretty solid. The colors are bright, the viruses have personality, and Luigi looks good as a doctor. The music is simple, but catchy. There are only a few tracks, but Nintendo made sure they were solid. Of course, the usual Dr. Mario theme is catchy, but the newer tracks are still fun to listen to. I have a few issues with this game though. I love the modes that you get in it, but I feel like there should have been a few more, like a puzzle mode that was similar to Tetris Attack, or the extra modes that you see in games like Pokémon Puzzle League. It just feels a little small for a game that is $15 on the Wii U e-shop. I also felt like they could have added more song tracks. There are about six tracks total in the game, and while they are fine and all, one of them was just a calmer version of the main Dr. Mario theme. This game might be light on content, but there is an addictive nature to it. I played Dr. Luigi for a couple of hours straight, and I can see this being a fun, competitive two-player game. The $15 price tag is a bit high, so I would try to get this game on a sale, but if you love puzzle games, I would say, spend the money for this game. Nintendo once again shows us how to make an addictive and enjoyable game.